StriVectin Brighten & Perfect Collection - helps you see your skin in a new light! Skin looking dull, tired and lifeless? StriVectin offers up a new collection of skin brightening solutions with cutting-edge technology to boost radiance and skin clarity to help improve the look of uneven skin tone! StriVectin Intensive Illuminating Serum - 30ml - $99 - a lightweight daily treatment that is clinically proven to boost and enhance skin’s overall clarity, brighten complexion, diminish dullness and intensify luminosity. Formulated with a safe complex of high-performance actives and NIA-114 technology, it out performs controversial Hydroquinone and gives skin an even brighter glow. You can look forward to restored skin texture for a more smooth, even-toned and radiant appearance. 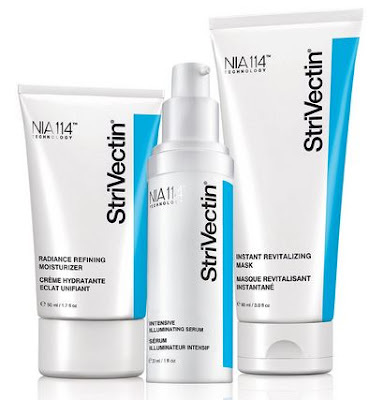 StriVectin Radiance Refining Moisturizer - 50ml - $99 - a super hydrating moisturizer that boosts skin’s overall brightness. The formula boats a unique blend of high-performance actives and NIA-114 technology that inhibits melanin production and protects skin from daytime stressors - for improved skin clarity, diminished dark spots and a more radiant complexion. StriVectin Instant Revitalizing Mask - 90ml - $68 - restores clarity, illuminates the complexion and leaves texture smoother, more refined and instantly brighter. The brightening complexes and integrated NIA-114 technology allows the formula to penetrate deeper into skin and promotes overall even pigmentation in age spots and a more youthful glow. Available now at Shoppers Drug Mart and Murale stores across Canada.